Skylands Region: Sussex County, Morris County, Warren County, Hunterdon County, and Somerset County. Gateway Region: Middlesex County, Union County, Essex County, Hudson County, Bergen County, and Passaic County. Shore Region: Monmouth County and Ocean County. Delaware River Region: Mercer County, Burlington County, Camden County, Gloucester County, and Salem County. 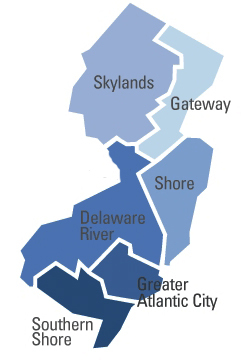 Greater Atlantic City & Southern Shore Regions: Atlantic County, Cumberland County, and Cape May County. Council Members serve many areas in New Jersey. Click on the area links to the right, the map above, or scroll down to find help in your area. Sussex County, Morris County, Warren County, Hunterdon County, and Somerset County. We can provide you contact with various elder care services in the Skylands Region. Although this area is temporarily without a member to assist you we can still help you solve any concerns or problems you may have. Please contact the New Jersey Care Planning Council by clicking on the link below. Middlesex County, Union County, Essex County, Hudson County, Bergen County, and Passaic County. We can provide you contact with various elder care services in the Gateway Region. Although this area is temporarily without a member to assist you we can still help you solve any concerns or problems you may have. Please contact the New Jersey Care Planning Council by clicking on the link below. Monmouth County and Ocean County. We can provide you contact with various elder care services in the Shore Region. Although this area is temporarily without a member to assist you we can still help you solve any concerns or problems you may have. Please contact the New Jersey Care Planning Council by clicking on the link below. Mercer County, Burlington County, Camden County, Gloucester County, and Salem County. We can provide you contact with various elder care services in the Delaware River Region. Although this area is temporarily without a member to assist you we can still help you solve any concerns or problems you may have. Please contact the New Jersey Care Planning Council by clicking on the link below. Atlantic County, Cumberland County, and Cape May County. We can provide you contact with various elder care services in the Greater Atlantic City & Southern Shore Regions. Although this area is temporarily without a member to assist you we can still help you solve any concerns or problems you may have. Please contact the New Jersey Care Planning Council by clicking on the link below.